Adapted from an updated version of the author's classic Electric Power System Design and Analysis, with new material designed for the undergraduate student and professionals new to Power Engineering. The growing importance of renewable energy sources, control methods and mechanisms, and system restoration has created a need for a concise, comprehensive text that covers the concepts associated with electric power and energy systems. Introduction to Electric Power Systems fills that need, providing an up-to-date introduction to this dynamic field. The author begins with a discussion of the modern electric power system, centering on the technical aspects of power generation, transmission, distribution, and utilization. After providing an overview of electric power and machine theory fundamentals, he offers a practical treatment-focused on applications-of the major topics required for a solid background in the field, including synchronous machines, transformers, and electric motors. He also furnishes a unique look at activities related to power systems, such as power flow and control, stability, state estimation, and security assessment. A discussion of present and future directions of the electrical energy field rounds out the text. With its broad, up-to-date coverage, emphasis on applications, and integrated MATLAB scripts, Introduction to Electric Power Systems provides an ideal, practical introduction to the field-perfect for self-study or short-course work for professionals in related disciplines. Mohamed E. El-Hawary has been Professor and Associate Dean of Engineering at DalTech of Dalhousie University (formerly the Technical University of Nova Scotia) since 1981. He has written more than 150 technical papers, mainly in power system engineering, and is an author of three textbooks: Power Systems Analysis, Principles of Electric Machines, and Control System Engineering. He is also coauthor of two research monographs on economic operations of power systems. Dr. El-Hawary chairs the IEEE Power Engineering Society Operating Economics Subcommittee, Life Long Learning Subcommittee, and Awards and Recognitions of the System Operations and Dynamic Performance Committee. He is associate editor of Electric Machines and Power Systems and the International Journal of Electric Energy and Power Systems. 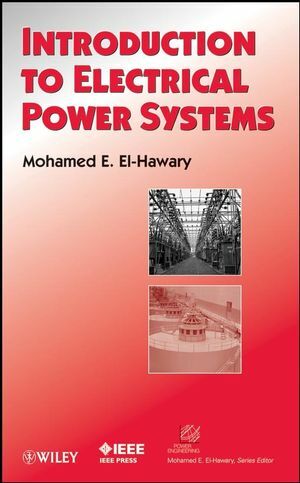 Dr. El-Hawary is also former Editor in Chief of IEEE Press serves as Editor of the IEEE Press Power Engineering Series. 1.1 A Brief History of Electric Power Systems. 1.2 The Structure of the Power System. 1.3 Outline of the Text. Chapter 2: BASICS OF ELECTRIC ENERGY SYSTEM THEORY. 2.2 Concepts of Power in Alternating Current Systems. 2.4 The Per Unit System. 2.5 Electromagnetism and Electromechanical Energy Conversion. 2.6 Permeability and Magnetic Field Intensity. 2.7 Flux Linkages, Induced Voltages, Inductance, and Energy. 2.9 Eddy Current and Core Losses. 2.14 Round or Smooth Air-Gap Machines. Chapter 3: POWER GENERATION AND THE SYNCHRONOUS MACHINE. 3.2 The Synchronous Machine: Preliminaries. 3.4 A Simple Equivalent Circuit. 3.6 Power-Angle Characteristics and the Infinite Bus Concept. 3.8 Salient-Pole Machine Power Angle Characteristics. 4.2 General Theory of Transformer Operation. Chapter 5: ELECTRIC POWER TRANSMISSION. 5.2 Electric Transmission Line Parameters. Chapter 6: INDUCTION AND FRACTIONAL HORSEPOWER MOTORS. 6.4 Classification of Induction Motors. 6.5 Rotating Magnetic Fields in Single-Phase Induction Motors. 6.6 Equivalent Circuits for Single-Phase Induction Motors. 6.7 Power and Torque Relations. 6.8 Starting Single-Phase Induction Motors. 6.9 Single-Phase Induction Motor Types. Chapter 7: FAULTS AND PROTECTION OF ELECTRIC ENERGY SYSTEMS. 7.2 Transients during a Balanced Fault. 7.3 The Method of Symmetrical Components. 7.8 The Balanced Three-Phase Fault. 7.9 System Protection, An Introduction. Chapter 8: THE ENERGY CONTROL CENTER. 8.2 Overview of EMS Functions. Chapter 9: THE PRESENT AND FUTURE OF ELECTRIC ENERGY SYSTEMS. 9.2 Challenges Facing the System. 9.3 Blackouts and their Impact. Updated to reflect the latest technology, this book is perfect for self-study by practicing engineers who need to hone their knowledge, or for students needing a comprehensive overview of power technology. Each chapter features examples of solved problems as well as problems for students to solve on their own.